If you've been following the Trailhead series, you've already made three stops along the path. Trail post 1 was about baptism. Trail post 2 was about God's Word. Trail post 3 was about prayer. Now, we are at trail post 4 which is about disciple making. This post is based on my pastor's sermon. It is part of the Trailhead Series. A disciple is one who follows the teachings of another. Discipleship is the act of teaching others to follow the teachings of another. Discipleship could be described as one beggar telling another beggar where to find bread. 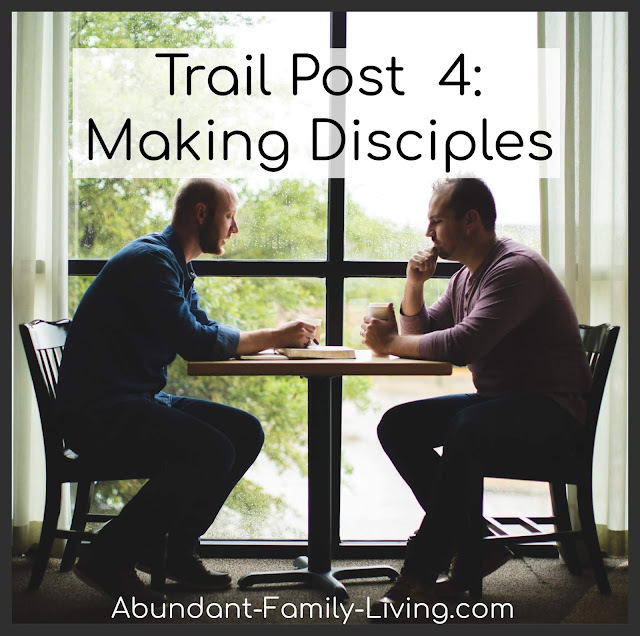 The main text for this particular topic of disciple making is John, chapter 4. This is the story of the woman at the well. Many others believed in Jesus because of the testimony of the woman at the well. The woman believed Jesus. Then, her purpose was to tell others about him. When we choose to follow Jesus, things we thought were important before aren't so important to us anymore. The woman left her water pot behind to go tell others who she had seen. In another story, a woman who washed Jesus' feet poured valuable perfume onto His feet. The value of the perfume is estimated to cost about a year's salary. When you choose to follow Jesus, you will be asked to leave something behind. Why do you suppose the woman came to the well at noon? It is said that it was customary for the women to go to the well early in the morning before the heat of the sun became too hot, but this woman came at noon in the heat of the day. Some believe she came at noon to avoid the other women. Perhaps she was embarrassed by her lifestyle. Jesus told her that she had had many husbands and the man she was currently with was not her husband. Perhaps she was afraid of what the other women might say or what they would think of her. After she realized who Jesus was, she must have forgotten all about her fear as she ran to tell others who she had just seen. Do you have a fear to overcome? The woman overcame her fear. What if you overcome your fear so that you can tell others your story? 1. Jesus' Story: Tell others about Jesus. 2. Your Story: If you are a follower of Jesus, you have a story. Tell it. Do you think your story isn't exciting enough? People with bad stories need people with good stories so tell it. 3. Fresh Stories: God is always doing something in your life. Tell it. The woman invited people to "come and see." What if you invite people to "come and see?" What if you invite people to church? If your neighbor is starving, would you give him bread? Tell your story (bread) so others won't starve to death. You have bread to give.